Carmike Cinemas will soon be serving alcohol at their Jefferson Pointe and Dupont locations. FORT WAYNE — Two Fort Wayne megaplexes are adding beer and wine to their concessions. Carmike Motion Pictures joins Cinema Center, a downtown arthouse theater, and Cinema Grill, which shows first-run movies in a cafe-style setting on the northeast side, as local venues where customers can gulp a cold brew while catching a comedy. Allen County’s Alcoholic Beverage Board on Monday unanimously approved license requests for the Carmike-owned theaters at Jefferson Pointe and Dupont Road. Combined, the two locations have 38 screens. 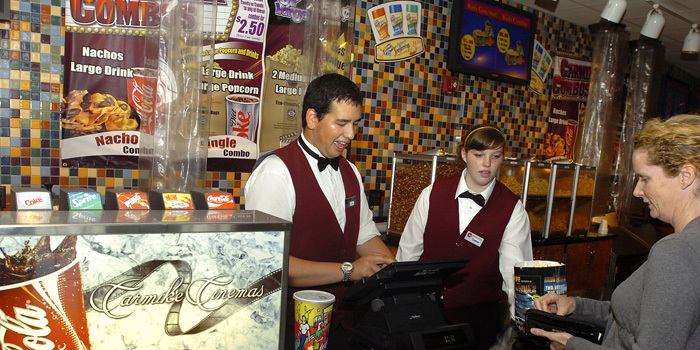 The theaters’ management says its procedures keeps alcohol away from underage patrons. Carmike policy states that only employees 21 and older are allowed to sell alcohol, and any employee caught selling to underage customers is fired, the attorney said. Other safeguards, he said, include requiring a photo ID for every drink purchased; requiring all drinkers to wear bracelets that show they’ve proven their age; limiting alcoholic drinks to three per person; and putting alcoholic drinks in cups visibly different from cups that contain soda. Carmike’s attorney said the theater chain faces increased competition from streaming services, including Netflix, which allow people to watch movies at home while they indulge in beer and wine. Rival theater owner Regal Entertainment Group installed leather recliners in its Coldwater Crossing location earlier this year to better compete with Carmike and at-home viewing options.